After the success of Pinball Dreams on several systems, a sequel featuring four new tables was created. The gameplay is much the same as the first game, with realistic physics, multi-player options and a high score table to aim for. The tables are Partyland, Speed Devils, Billion Dollar Gameshow and Stones 'n' Bones, taking in a funfair, racing cars, a tacky game-show, and a graveyard. Each one has a range of ramps, combos, light sequences and targets to shoot, as well as general themes which are less influenced by real tables than those in Pinball Dreams. 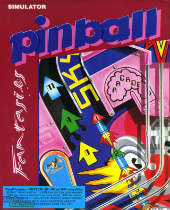 Pinball Fantasies Deluxe later added the four tables of Pinball Mania.